The D.A.I. model to better understand different mindests and cultural values: why social responsibility means higher prices? Few weeks ago, from a new Twitter follower, I’ve received a direct message with the following question: “Do you spend more money with a brand that you think is socially responsible?”. I felt immediately that it could be either a marketing research or a way to create awareness on something, nothing bad on it whatever it is. Anyhow, the aim of a question is to gather an information. So which is the information that the question above wants to address? 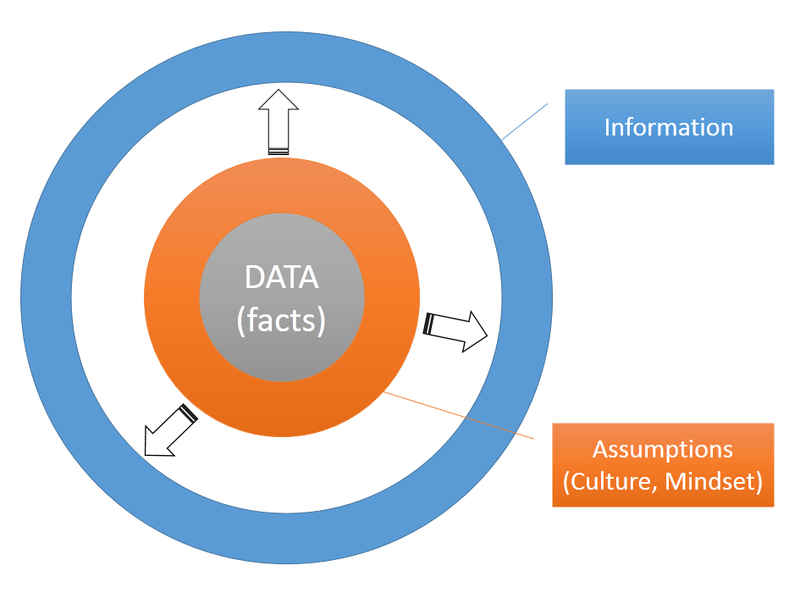 Suddenly came into my mind a principle from information theory: information is an interpretation of data based on assumptions (see figure). Usually assumption are due to culture, mindset and context in general. Think, as an example, how the same gesture of moving the head up and down (data) means yes for Europeans and Westerns but for Indians means exactly the opposite. First of all, the question is a close one since the answer must be yes or not. When I’ve realized that I felt myself uncomfortable… why? I thought and I realized that is due to the value of “social responsibility” that in the question is forced to be against “price” (money). Acknowledge that, I inferred unconsciously that if the answer of the question would have been YES it means that social responsibility is priceless thus more important that money. Vice versa, if the answer would have been NO. …however, why inferring such considerations? which is the assumption behind? That was my doubt and my hypothesis was that the assumption behind the tricky question “Do you spend more money with a brand that you think is socially responsible?” is: beeing social responsible costs! …wow, eureka! So, why not creating such conditions so that pursuing social responsibility implies intrinsically cheaper products? Bingo! The assumption that I’ve inferred is right. There is a kind of cultural impression, suggestion and mindset that unconsciously let us to think (me included) that if you want social responsible products there are no other ways: you have to pay more! Why? Paradoxically, since people behave according to incentives, if socially responsibility implies intrinsically cheaper prices instead, a virtuous circle will be established! How to create a context where the assumption “socially responsible = higher product” is replaced with “socially responsible = cheaper product”? …I don’t know, any idea? Meanwhile, why not applying the DAI (Data, Assumption, Information) model whenever we inferred quick answers? Behind each information there is an unknown world of undisclosed assumptions. This entry was posted in Coaching & Training, Leisure, Funny stories, Miscellaneous, Marketing, Personal & Leadership development, Psychology and tagged Culture, Information Theory, Marketing, Mindfulness, Psychology, Social Resposibility by ivangruer. Bookmark the permalink.